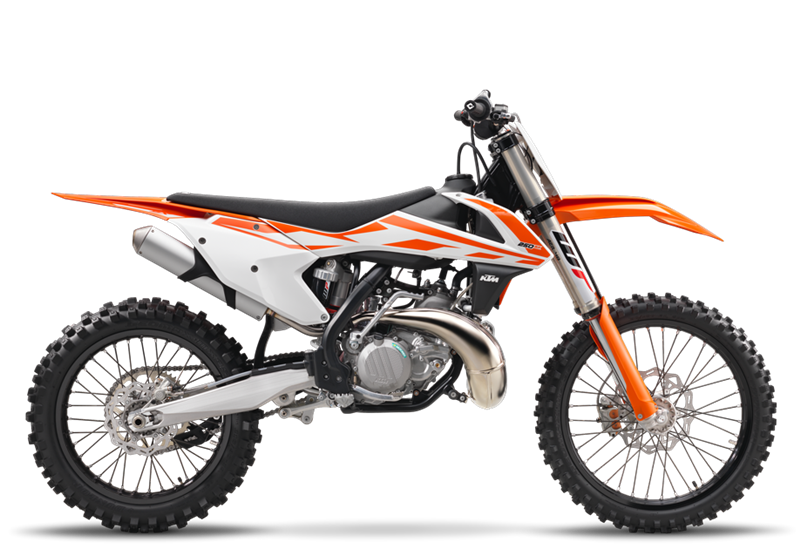 ENGINE The engine of the 250 SX has been known and respected for being the most powerful 2-stroke engine in its class. 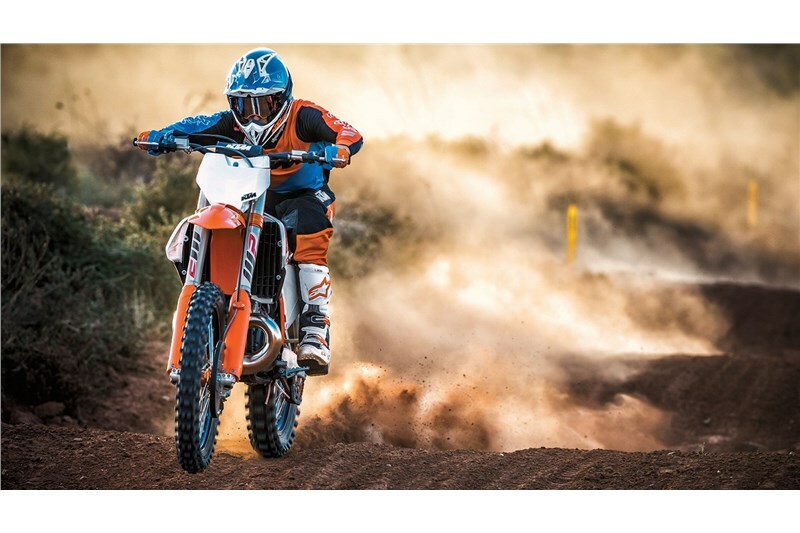 But we thought the segment could use an extra push and a solid statement: 2-strokes have a future at KTM. Their outstanding power-to-weight ratio, low cost and simplicity see to that. Putting our money where our mouth is, we gave the 250 SX engine an all new architecture with a new shaft arrangement for better mass centralization, a new cylinder with a twin-valve controlled power valve, a new counter balancer for less engine vibrations, a 5-speed transmission and a hydraulically operated DDS clutch. This compact fireball truly outshines the competition with absolutely ripping performance and is the right choice for lovers of premix. CYLINDER The newly developed cylinder of the 250 SX - with a bore of 66.4mm - has all-new ports and is fitted with an overhauled power valve system. This system features a sophisticated mechanism for the lateral support exhaust ports, providing smooth and controllable power on tap. Furthermore, it’s possible to change the bike’s power delivery in seconds thanks to two supplied powervalve springs. Limitless settings for different tracks and preferences are up for grabs. Throw everything you have at it; new water jackets in the cylinder and head will take care of excess heat and reworked lateral cylinder head brackets allow a more efficient fixation of the engine to the frame via lightweight head stays. Yes, this is a serious piece of kit. TRANSMISSION This reworked 5-speed gearbox has the same gear ratios as its predecessor, but our engineers took a close look at the mechanism in order to provide you with more precise and easier shifting. An advanced ´No Dirt´gear lever design prevents mud from clogging the folding tip for reliable shifts even in the worst conditions. ENGINE CASES These all-new die-cast engine cases feature an 8mm higher clutch shaft and a 27mm higher crankshaft, resulting in better mass centralization and quicker handling. In addition, it allows the implementation of a counter balance shaft. So your ride will be as relaxed as it is rapid. Plus, your new favorite engine will keep looking as fresh as the day you bought it with redesigned engine covers featuring a smart surface structure in order to reduce the wear caused by the rider’s boots. COUNTER BALANCE SHAFT Say goodbye to numb feet and hands. The new engine design allows the implementation of a lateral counter balance shaft in order to reduce the vibration level drastically - 50% lower level on handlebar and foot pegs. 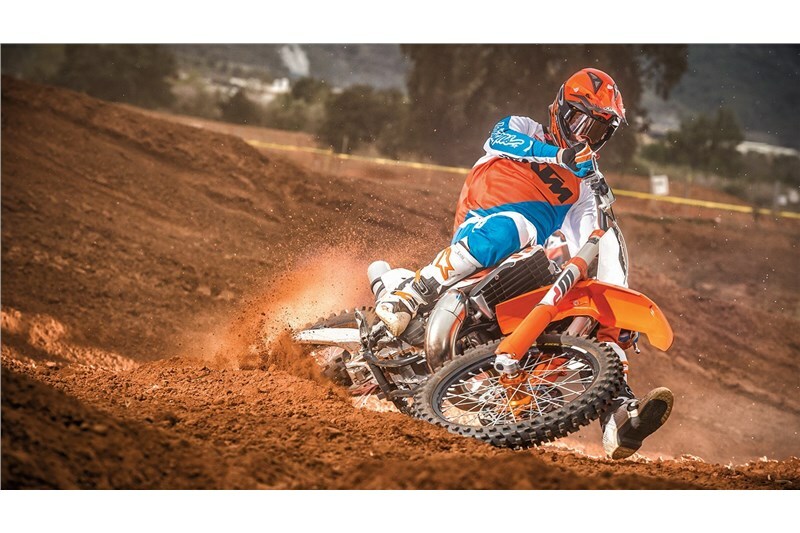 You know what that means: less fatigue at the end of the moto so you can push when it really counts. 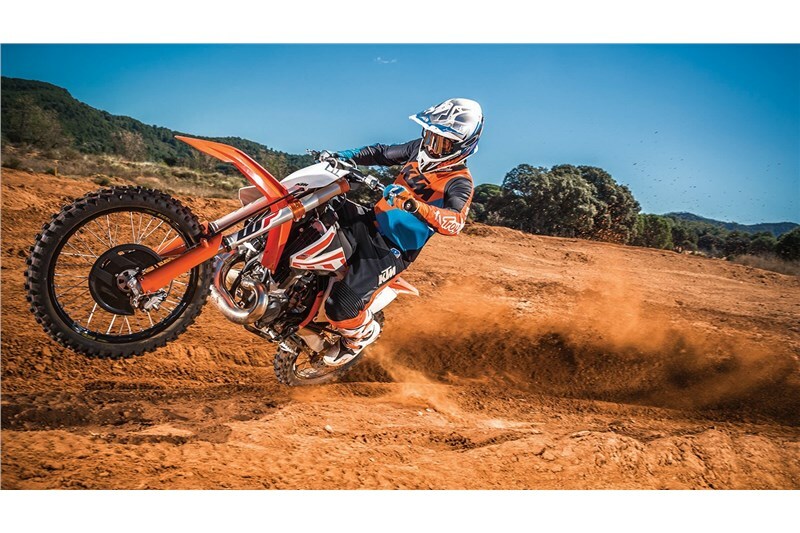 CLUTCH The 250 SX employs the KTM-developed DDS clutch (damped diaphragm steel) with a wear-free steel basket and extremely heat resistant clutch plates. This clever design employs a diaphragm spring instead of the usual coil springs, making for considerably easier clutch action. A diaphragm spring also leaves sufficient space for a damping system to be integrated into the clutch hub. The goal is traction, but durability is as well. A lighter basket, a reworked inner hub and a pressure plate providing better oil supply and unsurpassed cooling up the longevity of the DDS clutch. Light operation and telepathic amounts of control are standard with this hydraulic Brembo actuated clutch. EXHAUST The engineers meticulously tuned the expansion chamber for maximum power. An advanced 3-D production process now guarantees higher precision manufacturing for a strong pipe that provides perfectly tuned power. CRANKSHAFT Its 72mm stroke is the same, the rest is brand new. The 250 SX’s crank has been rebalanced, revamped and set-up with a counter balance shaft to kill vibrations, not your vibe. 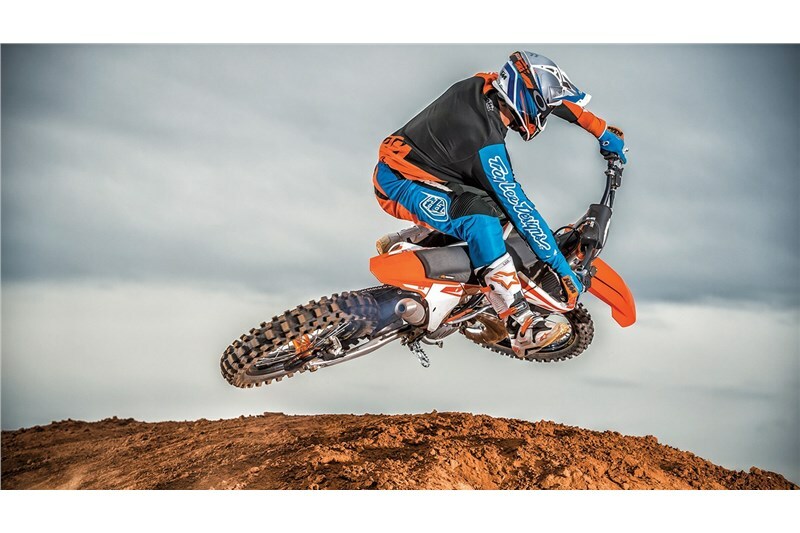 FEATHERWEIGHT KTM engineers just love dropping weight year after year. 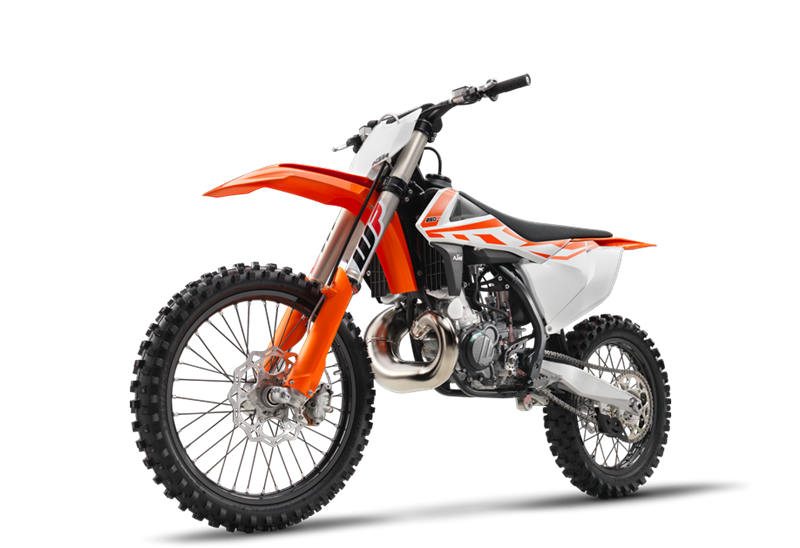 The result: the 2017 SX models are the slimmest, lightest dirt bikes out there. 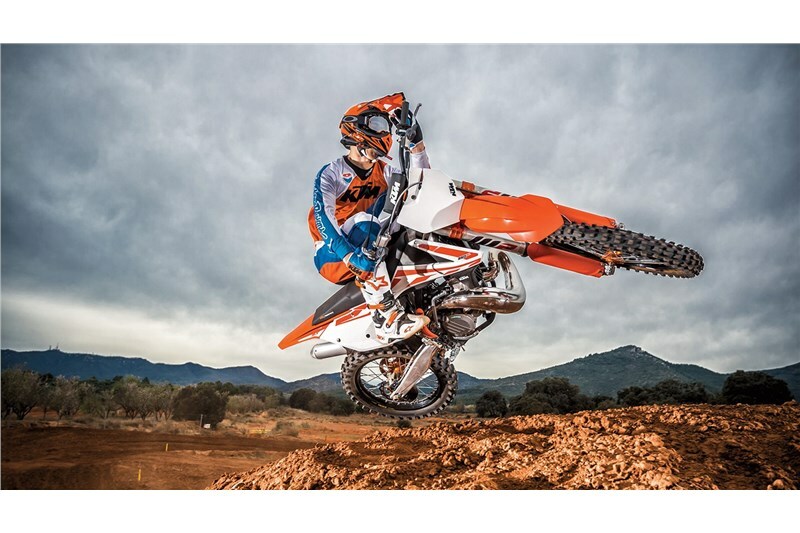 GRAPHICS New graphics convey the READY TO RACE character of the 2017 SX model line.